Last week we talked about cold-weather safety and “weatherizing” overhead crane components for the winter season. Cold-weather can impact multiple features of a crane including its rating and electrical components, all of which can be a safety issue in extreme situations. However, it is important to note, that your crane operator’s much more likely to suffer from cold-weather trauma than your actual crane. And, the safety of your workers is always priority number one. For employees who work in industries like construction and outdoor manufacturing, there’s a good chance they will be exposed to severe weather conditions for several months out of the year. This year has been particularly cold. Even though the temperatures are dropping, we still have to get the job done. So, we’ve prepared an overview for employers, crane operators, and outdoor-workers to help prevent cold weather related accidents. But, before we begin, please note that the order in which the following conditions are listed is generally the order in which they occur. Frostnip and frostbite occur before hypothermia because they’re our body’s way of protecting our core temperature and organs. By storing the cold blood in our extremities, we are effectively keeping it from reaching the heart, lungs and brain, and keeping the core body temperature from dropping. It’s an important distinction, as it can mean the difference between life and death. Furthermore, frostbite often leads to dead tissue and amputation, dehydration can cause workers to pass out or lose consciousness, leading to more serious issues, and wind chill can burn human flesh rapidly. With that said, here’s a list of common medical conditions that can occur quickly when crane operators and construction workers are forced to work outdoors in cold climates with inadequate protection. When working outdoors in cold weather, there are several serious medical conditions that can occur if employees aren’t aware of their symptoms and how to prevent them. The first, most basic condition is dehydration. Dehydration can occur during cold climate working conditions when workers are wearing multiple layers to stay warm and begin to perspire from exertion, despite the cold temperatures outdoors. Most often, this occurs when workers don’t stop to think about rehydrating when it’s cold outside. It’s essential to replenish fluids in the body when working in any climate, but cold climate conditions can sneak up on you, making them less predictable. Wind chill can create additional challenges for crane operators and other employees working outside in cold climates. As the temperature decreases and the wind speed increases, the wind chill index also increases. This can create a much greater risk for frostbite. High wind chill values can rapidly freeze human flesh, and it only takes minutes to endure long-term damage. It’s important for employees to avoid working outside when high wind chills are present, unless adequate skin protection (specialty clothing) can be provided. Crane operators and employees working outdoors in cold weather conditions need to be aware of the warning signs of frostnip. The symptoms of frostbite generally begin with those of frostnip. Frostnip is nature’s way of warning our body that hypothermia is about to set in. It’s important to take these symptoms very seriously if they occur. Hands, feet, and extremities are the most common areas to be affected by frostnip and frostbite; however, any unprotected skin is susceptible. Symptoms of frostnip begin with stinging pain and redness and generally progress toward frostbite with increased pain, pale skin, tingling, and numbness. Sometimes, workers may not even notice symptoms of frostnip because they’re exerting so much energy on the job site. That’s why it’s so important to protect skin from exposure to cold weather and take intermittent breaks to check extremities for any signs of frostnip. Once frostnip is detected, the symptoms can usually be reversed with a lot less difficulty than frostbite. That’s why it’s so important to keep skin protected and check potentially affected areas from time to time, as you work. Once frostnip sets in, it isn’t long before frostbite follows. Frostbite causes the upper layers of the skin to crystalize and turn brittle. When frostbite occurs, the frozen extremity may appear completely white or even purplish-blue and white in patches. Depending on the temperature and degree of the wind chill factor, frostbite can easily occur in less than five minutes. Hypothermia is a very serious medical condition that occurs when your body loses heat faster than it produces it. The most common causes of hypothermia are exposure to cold-weather conditions or extremely cold water. But, prolonged exposure to any climate colder than your body can lead to hypothermia if you aren’t dressed appropriately or can’t control the conditions around you. Signs and symptoms of mild hypothermia include: shivering, dizziness, nausea, confusion and lack of coordination, rapid breathing, fatigue, and increased heart rate. Any worker experiencing these symptoms on the job needs to seek medical attention quickly before the condition is allowed to progress any further, which can easily lead to death. 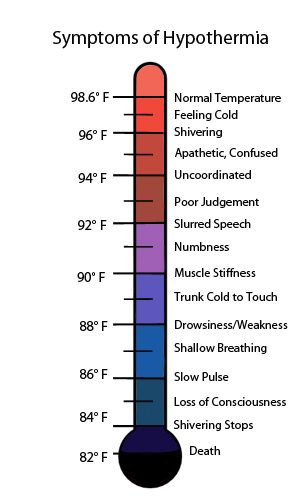 As the body’s temperature continues to drop, signs and symptoms of severe hypothermia include: shivering (although as hypothermia peeks, the person affected may become too weak to physically shiver), clumsiness, slurred speech, extreme confusion, drowsiness, lack of concern about one’s condition, progressive loss of consciousness, weak pulse, slow and shallow breathing. Wear clothing that is warm enough for the current weather conditions, and carry along extra protective gear in case temperatures continue to drop or wind chill rises unexpectedly. This is important even if your workload is short. Frostbite and hypothermia can occur in minutes, and if you aren’t prepared, they can lead to amputations or death. Take intermittent breaks from cold temperatures to come inside and warm up. Staying out in the cold for too long is exposing yourself to a potentially catastrophic situation. Avoid working near or falling into water. If wet clothing becomes a problem, remove clothes immediately or get to a warm, dry location. Use the buddy system: rely on a working partner to hold you accountable to intermittent breaks, staying hydrated, keeping dry, and staying protected from wind chill and dangerously cold weather. Using the buddy system also helps to ensure someone will be there to seek or administer medical attention if something does go wrong. Move the person to a warm, dry location. Shield him or her from wind and frigid air as much as possible. Remove any wet clothing the person may be wearing. Cut away the clothing if necessary to avoid excessive movement. Use layers of dry clothing or blankets to warm the person—if possible. Cover his or her head, leaving only the face exposed. If you’re outdoors, be sure to insulate the person’s body from the ground. Lay the person on a blanket or other relatively warm surface. Monitor breathing: a person with severe hypothermia may appear unconscious. They may have no apparent signs of a pulse or breathing. If the person’s breathing has stopped or appears dangerously shallow, begin CPR immediately. (Another reason why it is so important to receive proper CPR training). Skin-on-skin contact is also an affective way to warm someone suffering from hypothermia. Create skin-on-skin contact, and cover both of your bodies with blankets to keep body heat in and cold air out. Provide warm beverages if possible. If the person affected is conscious and able to swallow, provide a warm, sweet, NON-ALCOHOLIC, non-caffeinated beverage to help warm the body without affecting the heart or other major organs. Use a first-aid warm compress, which is a plastic bag filled with fluid that warms when squeezed. If a first-aid compress is not available, you can use a makeshift warm compress by putting warm water in a plastic bottle or using a dryer-warmed towel. The key is to keep the person DRY but warm. Apply the compress only to the neck, chest wall, or groin area. It is very important to avoid applying the compress to arms, legs, and other extremities. Doing so can force cold blood back toward the heart, lungs, and brain, causing the core body temperature to drop, which can be fatal.